teaching about Body in motion. From childhood, my parents had the great idea to send me to Judo classes and I practiced this art of movement during a few years, till blue belt. I liked very much almost all kind of sport and did also during a few years volley-ball at a national Junior level. It is only later in my life, when I was about twenty two years old that I discover my passion for dance and realized that I could not think about anything else then become a dancer. So I worked hard, never having the feeling that it was hard work because the pleasure was constantly there. This pleasure did not change and the morning class with the company is still, for me, even after thirty five years, one of the most pleasant moment of the day. 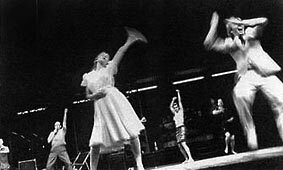 After the discovery of dance, and after my engagement in the Pina Bausch Tanztheatre company, I learned and practiced Tai-Chi and Aikido. 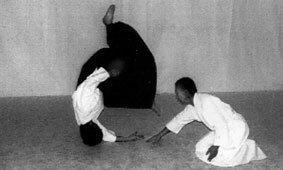 Two years after that I started Aikido by master Asai in Dusseldorf, I was introduced to master Noro in Paris, and from then, parallel to my professional activities as dancer and choreographer, I dedicated myself to Kinomichi. I write about all this just to explain that behind my love for dance, there was and is a deep interest in body in motion. Learning and practicing all those different type of work and use of the body, those different technics, brought me to the point to think that beyond all there differences, there was a basic concept where all those body works, and arts of movement would meet. Modern-dance, Ballet, Jazz-dance, Aikido, Kinomichi, Tai-Chi, Kabuki, in fact all practice using the body movement, have one thing in common. It is all about a body in motion between the floor (Earth) and the environment space (Sky).